NYC, 04/23/2019, 7:00PM. 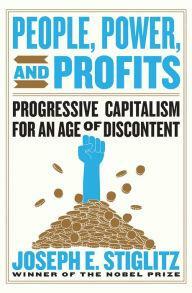 People, Power, and Profits: Progressive Capitalism for an Age of Discontent: The Latest Book from Nobel Winner Joseph E. Stiglitz. Joseph E. Stiglitz, a Nobel Prize-winner, challenges us to throw off the free market fundamentalists and reclaim our economy. Too many have made their wealth through exploitation of others rather than through wealth creation. But as Stiglitz demonstrates, it may not be too late to create a progressive capitalism that will recreate a shared prosperity and a middle-class life attainable by all.